Before the advent of the aeroplane, acoustic location was applied to determining the presence and position of ships in fog. However little faith was placed in this because the apparent direction of sounds in fog at sea was known to be sometimes deceptive. 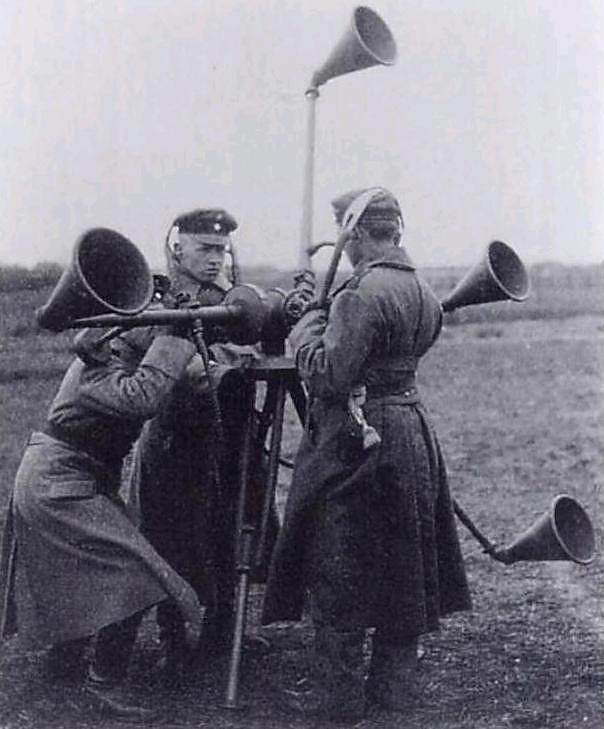 Acoustic location was used from mid-WW1 to the early years of WW2 for the passive detection of aircraft by picking up the noise of the engines. Horns give both acoustic gain and directionality; the increased inter-horn spacing compared with human ears increases the observer's ability to localise the direction of a sound. 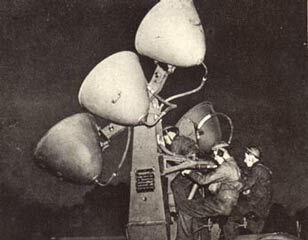 The technology was rendered obsolete before and during WW2 by the introduction of radar, which was far more effective. Left: Professor Mayer's topophone: 1880. This image has been reproduced many times in the past, but I could hardly leave it out, so here it is again. It was devised to assist navigation in fog. I have no information on its success or otherwise. 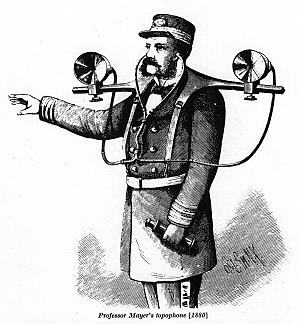 The Mayer Topophone was patented in the United States by Alfred M. Mayer in 1880, US patent number 224199. From 1871 until his death in 1897, Alfred Mayer was a Professor of Physics at the Stevens Institute of Technology in Hoboken, New Jersey. I have record of two earlier devices of similar nature, that of Benjamin R. Smith (US Patent 23718 in 1859) and of James Cochrane (US Patent 110827 in 1871). Left: German sound location: 1917. In the 1930's the Dutch set up an 'Air Watch Service', similar to the British Observer Corps, to detect incursions of foreign aircraft. 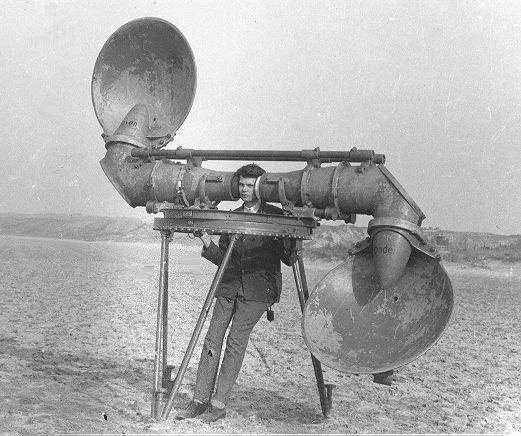 It was impractical to equip the many scattered locations with the more sophisticated sort of listening devices displayed below in the 'Transportable Horns' section, so several 'personal sound locators' were developed by the Dutch military research station at Waalsdorp. Apparently this version was the most effective. This beauty consists of two parabolic sections, presumably made from aluminium for lightness. They are mounted a fixed distance apart, but the size of the human head varies somewhat. 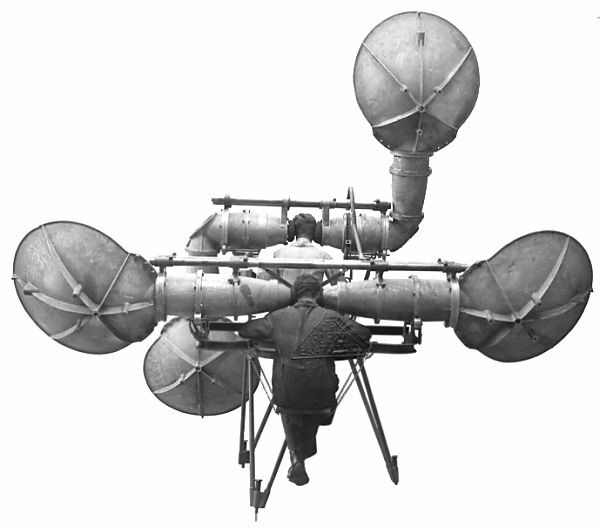 To accommodate this, it appears that the instrument is fitted with inflatable ear-pads, to which the parabolic sections are mounted by a star-shaped arrangement of strings; tubes from each ear-pad join in a T-piece and a further tube runs down to what appears to be some sort of valve which may or may not be connected to something in our hero's top pocket. It seems likely that the ear-pads were inflated by mouth. "You can top up your air at any time..." From his pained expression, it looks as if this chap may have overdone the inflation. According to a report dated 1935, this device was put into at least limited production. 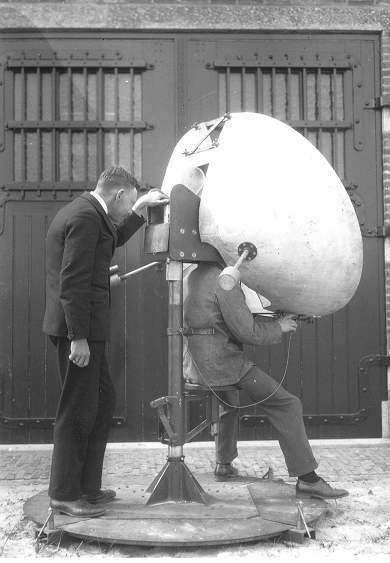 One of the experimental 'personal sound locators' tested by the Dutch military research station at Waalsdorp, before the personal parabolas above were adopted as the best solution. This design no doubt had more gain, thanks to its greater area. It swivelled on the post behind the operator. This is a later version of the design above. Note the extra cross-bracing added at the top of the horns. There are two counter-weights sticking out towards the rear. Rubber rings cushioned the operator's ears. This equipment was said to be accurate to two degrees. Eighteen of these were built from 1934 onwards, for the Engineer Regiment of the Dutch Army in the East Indies. A report, dated 10 April 1934, mentions thirty more delivered, with eighty more in production. You could argue that this device is stretching the definition of a 'personal' horn. All the information known is in the text that accompanies the picture. I believe this comes from one of the American science magazines. Probably published in the 1930s, as it is taken for granted that the readers will know what an airplane detector is. Surely the receiving horns should be pointing directly forwards? Left: Unidentified personal locator: 1938? 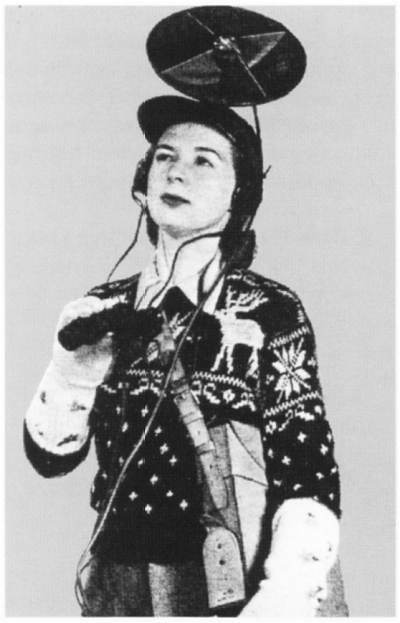 This picture shows a civil defence volunteer, probably (judging by the sweater and gloves) from a Scandinavian country. The young lady detects the aeroplane with the small parabolic reflector mounted on her head, and then identifies it with the binoculars she is holding. Such a small reflector will give little gain, but the case under her left arm presumably holds a battery-powered valve amplifier. Certainly she is wearing headphones rather than a stethoscope, and is tastefully draped with electrical wires rather than acoustic tubing. The date is just my guess. Possibly this is a propaganda photo intended to draw attention away from radar, but if so it's quite convincing. If anyone has any more information I would be very grateful to hear it. 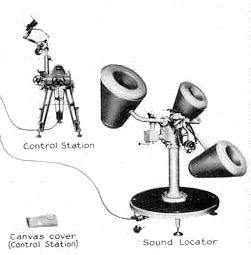 Left: Jean Auscher's maritime acoustic locator: 1960. 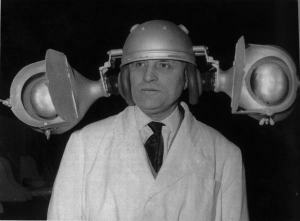 This remarkable headgear was invented by Frenchman Jean Auscher as an acoustic navigation device in case of radar failure on small vessels. 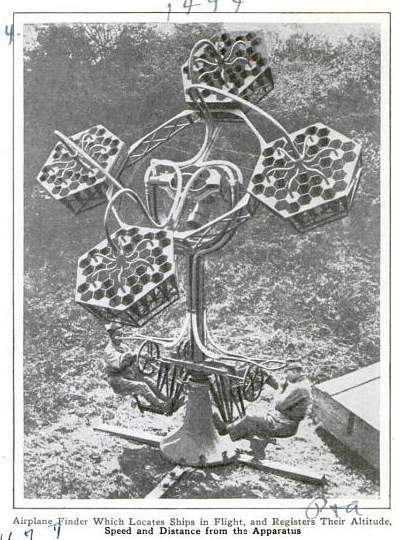 Shown at the 1960 Brussels Inventor's Fair, and, one suspects, nowhere else ever again. If he thought it was a new idea he was sadly mistaken. This picture can also be seen in the "Failed Projects" department of the Amplifier Institute, here: Jean Auscher. The instruments in this section are presented in chronological order. However some of the dates are a bit vague, so there has been a little guesswork in that direction. Left: The experiments of the Rev J M Bacon: 1898. Unfortunately, the account the Reverend Bacon gives in English Mechanic is so vague and discursive that it is impossible to work out what the purpose of these experiments was. However, it can be stated with certainty that they involved balloon ascents from Crystal Palace in London, and a small army of volunteers armed with giant ear-trumpets. It may be stretching a point to call this acoustic location, but I could not resist the picture of the Victorian lady sprawled in the grass by the cart-mounted ear-trumpet. It is believed that the chap at left with the long white beard is the Rev John Mackenzie Bacon himself. I must admit that my first thought was that he was some sort of fruitcake, but Wikipedia put me straight; he was a Fellow of the Royal Astronomical Society, and well-respected. From English Mechanic 30 Sept 1898, p155. Left: The Rev J M Bacon takes to wireless: 1901. Quite by accident I discovered this little nugget of history. It appears that by 1901 the Reverend J M Bacon had got with the program and was using wireless instead of shouting for balloon-ground communications. Nevil Maskelyne was an illusionist and also a wireless experimenter. Wikipedia has a little information on him: Nevil Maskelyne. He should not be confused with his dad, John Nevil Maskelyne, or Nevil Maskelyne, the Astronomer Royal from 1765 to 1811. The Rev Bacon wrote a history of aeronautics called The Dominion of the Air in 1903, which is a free read at Google Books or from archive.org. 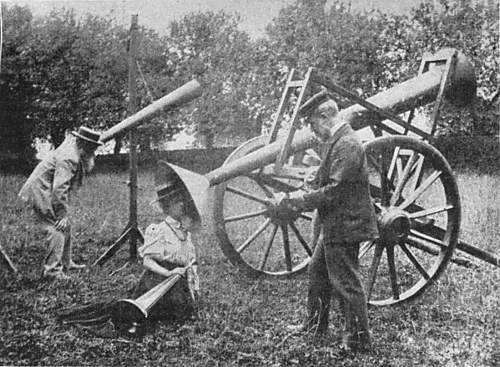 Left: A British Mk 1 sound locator: 1914-18. This model was used for location in the First World War, when aircraft flew relatively slowly and acoustic detection was a fairly practical proposition. It was manufactured by A.W. Gamage Ltd, who ran a famous department store in London specialising in toys, bicycles etc. This example is in the Canadian War Museum, Ottawa, Canada. 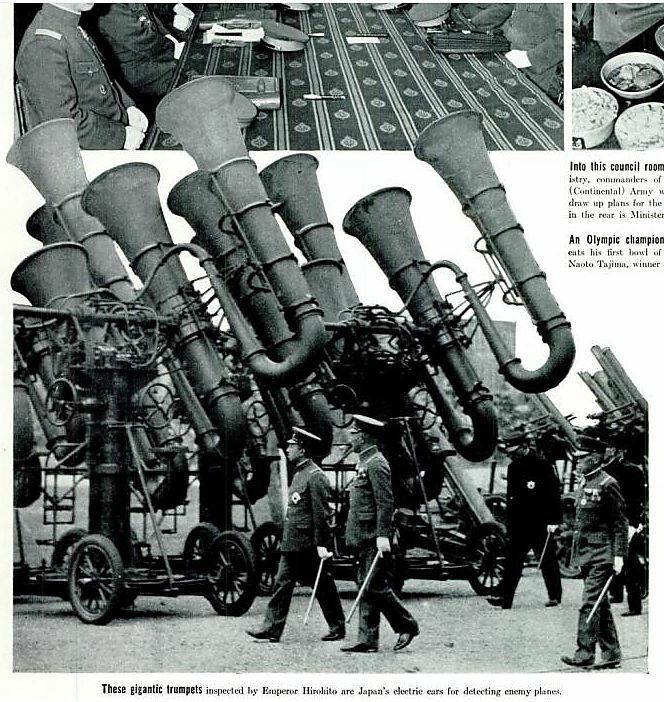 Left: A four-horn acoustic locator in England: 1938. There are two horns in the horizontal plane, and two in the vertical plane. The latter are at top and bottom left of the picture. Whether the horns were of crude flat wood construction as they appear to be, or if the flat panels were a protective casing for a more conventional horn remains a matter for speculation at present. 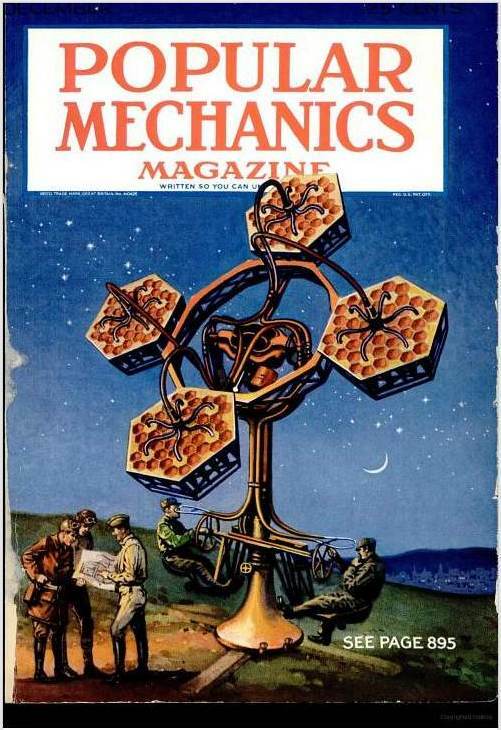 This picture appeared in Popular Mechanics for Dec 1938. The caption describes the personnel as being from the Royal Engineers, (part of the British Army) but it seems more likely that they were actually from the Royal Observer Corps, who were civilians; however, the older chap on the right is wearing a distinctly military forage cap. Deep waters, Watson. 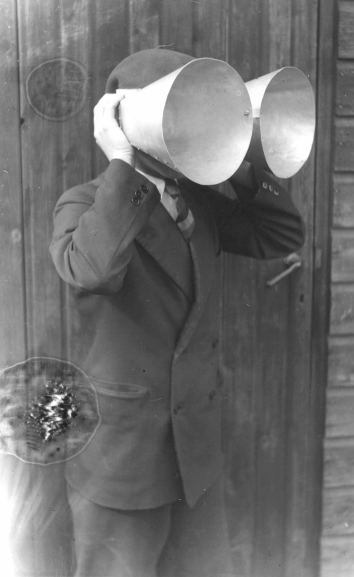 Left: A four-horn acoustic locator again, in England: 1930s. 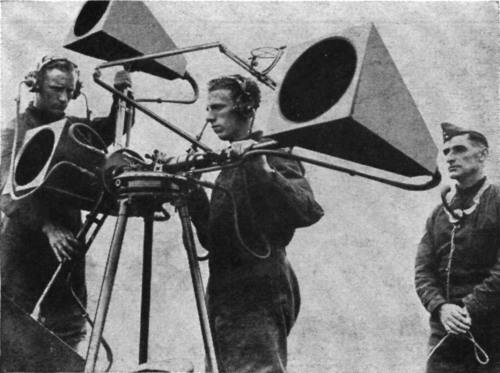 Once more there are three operators, two with stethoscopes linked to pairs of horns for stereo listening. The exact method of operation is currently unknown, but I suspect was as follows: the man on the left adjusts the mounting elevation until the aircraft noise is apparently central, while the chap on the right adjusts the bearing for the same result. 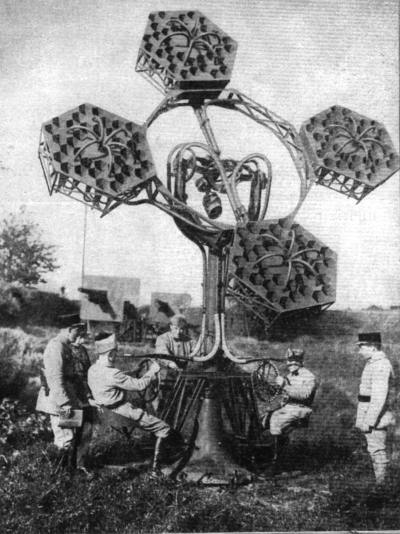 The man in the middle reads bearing and elevation from dials and transmits it by telephone to the air defence system where the results from several locators can be combined to triangulate the target, and give its approximate height and position. Note that this version is not the same as that above. The two horizontal-plane horns are now on the same side of the tripod. This is believed to date from about 1937. 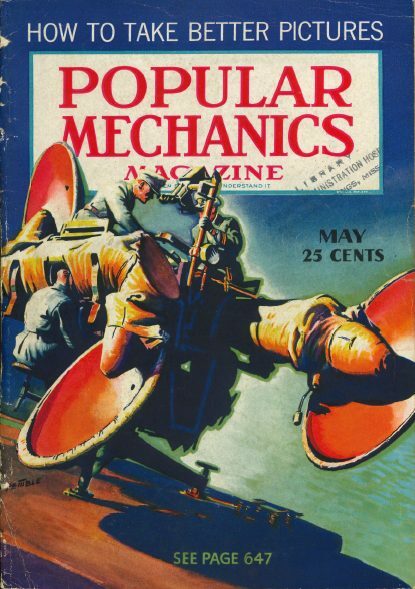 Other cards in the series show biplanes as fighter aircraft. Regrettably nothing has so far been unearthed about this equipment. 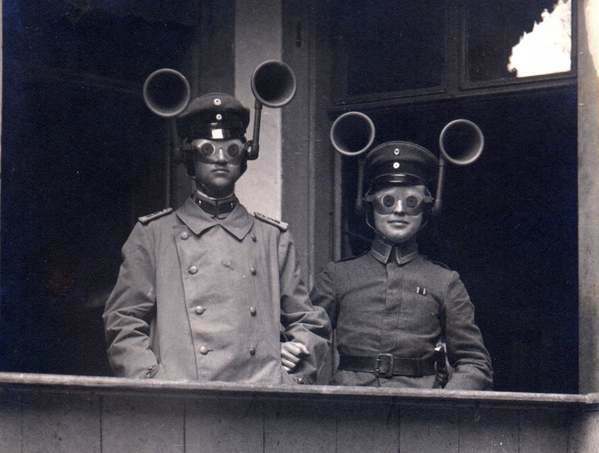 Left: A Czech four-horn acoustic locator: 1920s? There are two horns in the horizontal plane, and two staggered in the vertical plane. 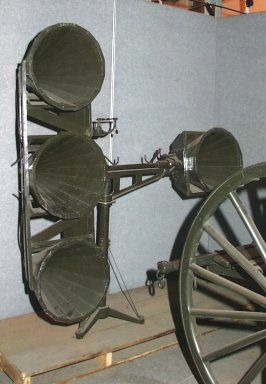 Scoop-shaped reflectors direct the sound into large-diameter tubes. Manufactured by Goerz. When tested at the Dutch military research station at Waalsdorp it was found it "contained fundamental deficiencies". Left: The height-locating half of the Czech four-horn acoustic locator. This picture also shows testing at Waalsdorp in Holland. 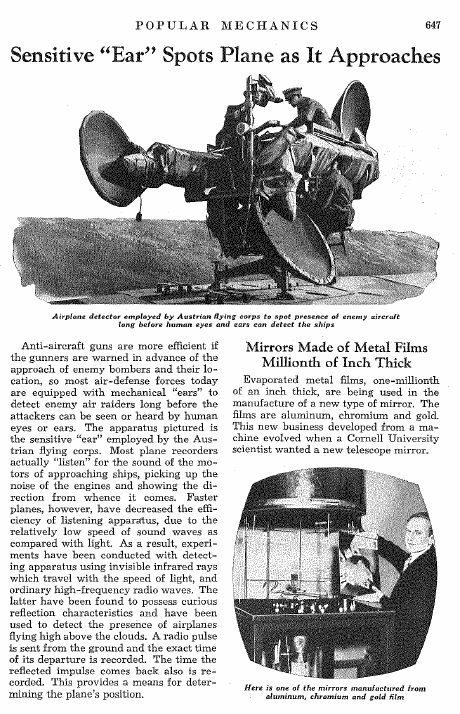 The only information on Austrian sound locators so far unearthed is this article in Popular Mechanics in 1937. The cover shows an unidentified three-horn system that bears a strong resemblance to the Czech four-horn system shown Above, except it's missing a horn. In both cases one operator puts his head right inside the apparatus. I suspect that this is deliberate misinformation, designed to make potential enemies think that the USA was relying on sound location rather than radar. The Austrian locator looks as if it was derived from a Czech design that was already known to be ineffective. (I might point out that Austria was next-door to what was then Czechoslovakia, and before that Czechoslovakia had been part of the Austro-Hungarian empire) The accompanying article actually gives hardly any information at all, though rather surprisingly it does refer to radar and notes that it is more effective. This photograph appeared in the Illustrated London News for 5th September 1936. It was claimed to show a Japanese locator, but in fact it is a "paraboloid of Baillaud" developed by Ren� Baillaud in WW1 between 1916 and 1918, and finally adopted by the French army in 1918. 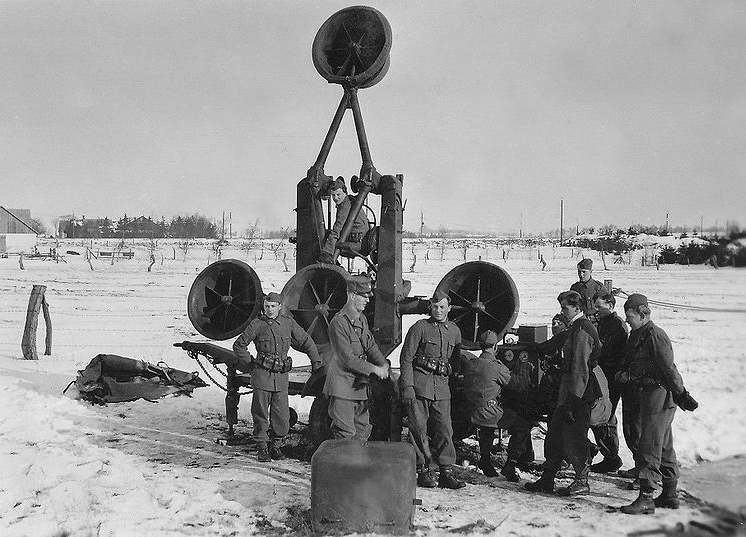 Not exactly hot news, but its publication may have been part of a deception plan to make the Germans think that the Allies were going to rely on acoustic detection in WW2. I assume the Japanese identification was just a mistake by the paper. 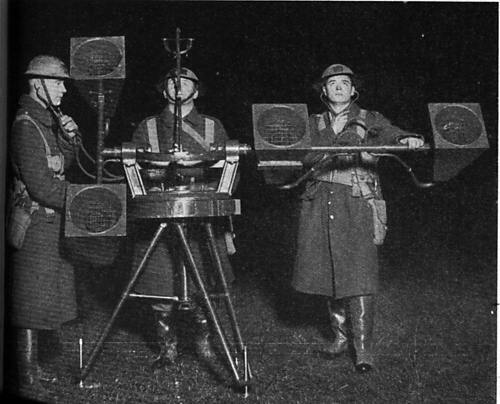 Left: French airship detector and searchlight: 1916? Note the six mini-horns in each of the four circular units. The function of the machine in the middle with the bicycle wheel is obscure; presumably it was to keep the locator and the searchlight pointing in the same direction. 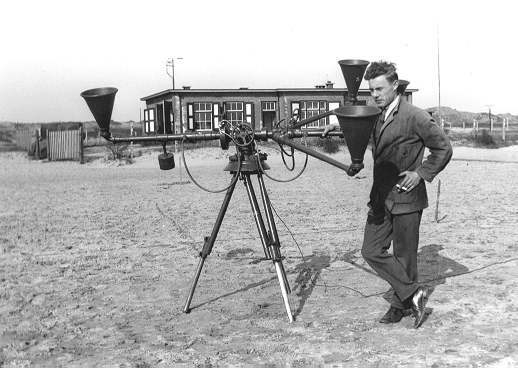 Left: Perrin acoustic locator on trial in France: 1930s. This remarkable machine is now identified as a t�l�sitem�tre, designed by French Nobel prizewinner Jean-Baptiste Perrin. Perrin was an officer in the engineer corps during World War I. This machine appears to be a development of the one above; the design is now based on hexagons. Each of the four assemblies carries 36 small hexagonal horns, arranged in six groups of six. Presumably this arrangement was intended to increase the gain or directionality of the instrument. There appear to be three operators, and two officers just watching. 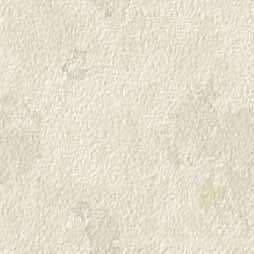 Further details of the Perrin locator are proving hard to come by. Only two operators are shown here. Clearly a retouched version of the photograph above, with the distracting background removed. The evolution of an image; the cover artwork is clearly copied from the retouched photograph above. This version of the Perrin locator has only two horns. 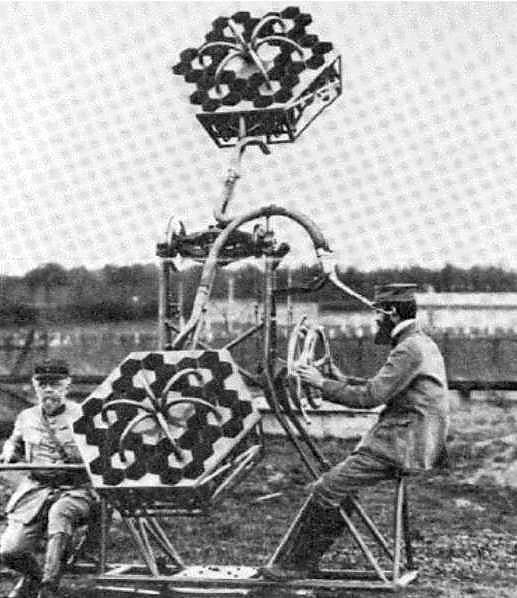 It is not clear what the depressed-looking fellow on the left is doing, but his colleague on the right appears to be in charge of adjusting both bearing and azimuth, using two coaxial hand-wheels. This picture is believed to show operation during WW1, but this is unconfirmed. 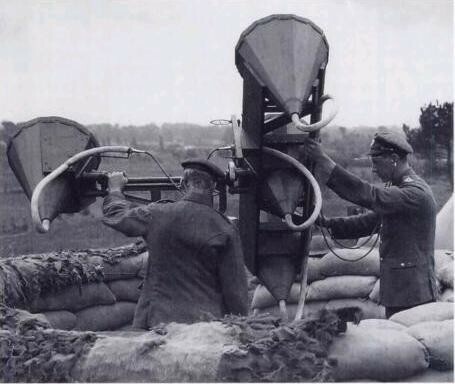 It is shown here being evaluated at the Waalsdorp research station in Holland in the 1930s, for possible use by the Dutch army. The French firm of Barbier, B�nard and Turenne (French Wikipedia) was founded in 1862. It specialised in the manufacture of lights, optical devices and lighting systems. The firm was dissolved in 1982. 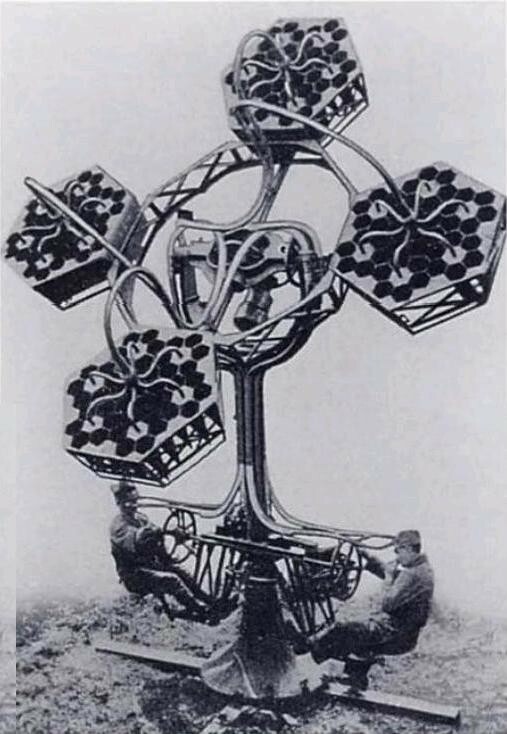 This device was based on the researches of Erich von Hornbostel. 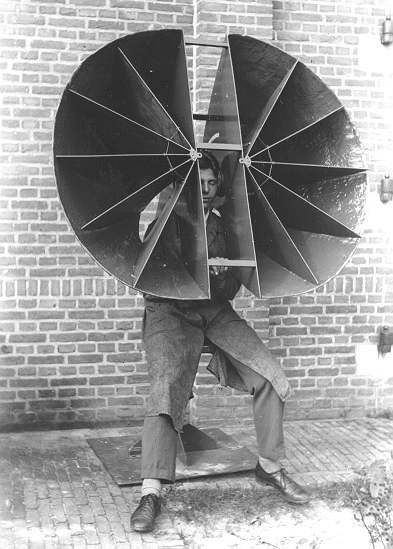 With Max Wertheimer, he developed in 1915 a directional listening device that they referred to as the Wertbostel. This device seems to have had some success as they were still discussing licence fees with manufacturers as late as 1934. The locator looks like a three-horn design here but in fact the fourth-horn can just be seen behind the operator's head. This was a commercial version of the Wertbostel described above, manufactured by Askania of Germany. It is shown here being evaluated at the Waalsdorp research station in Holland in the 1930s, for possible use by the Dutch army. It was obsolete and found to be unsatisfactory, very likely because the small horns would have given little acoustic gain. 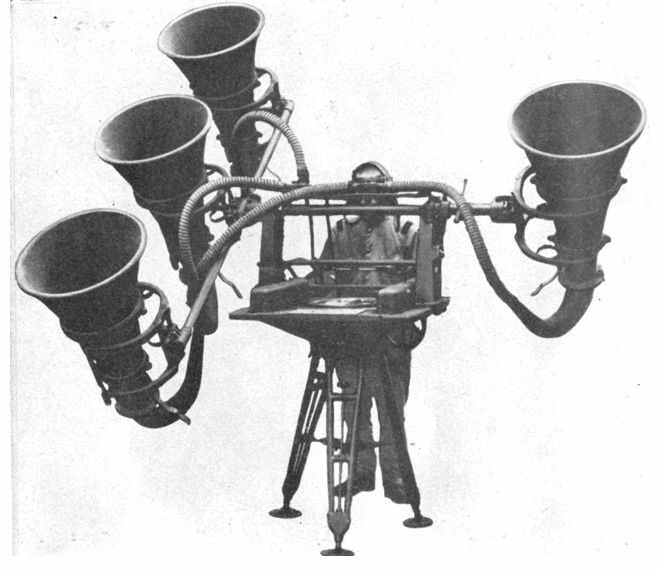 It was formally called a "Doppelt Richtungsh�rer" or "Double-direction listener" but informally, a Wertbostel, a combination of the inventor's names. 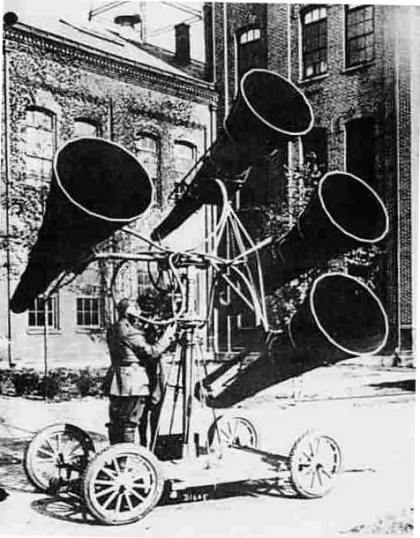 Askania Werke (German Wikipedia) also manufactured sound locators and blind-flying instruments under licence from Sperry Gyroscaope in the 1930's. At this time there was free exchange of information between the USA and Germany. 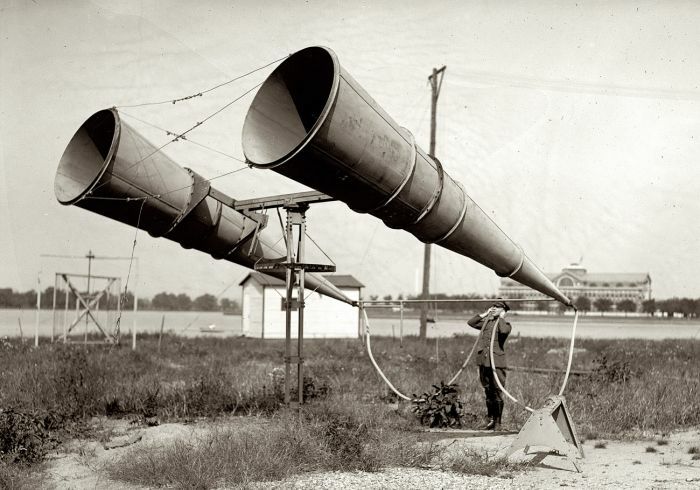 Left: A German RRH acoustic locator at an unknown location: 1940s? This much more impressive piece of apparatus was called the Ringtrichterrichtungshoerer (or RRH) which Matthias Warkus tells me translates literally as "ring funnel direction hearer", or more accurately: "ring-horn acoustic direction detector". 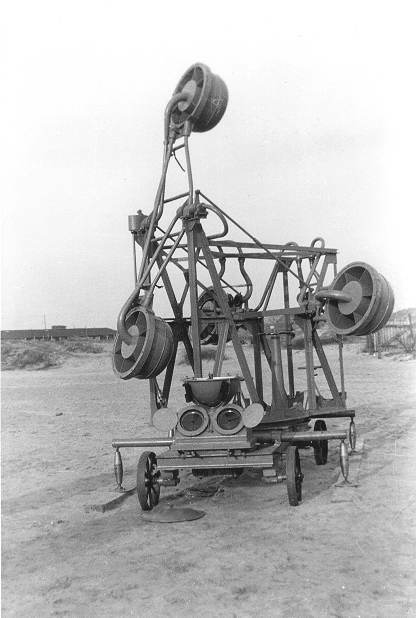 The RRH was mainly used in World War 2 antiaircraft searchlight batteries for initial aiming of the searchlights at night targets, presumably because it was cheaper and easier to make than a radar set. Later in the war they were replaced by radar sets. Like the British and French versions, the RRH was also composed of four horns, two to determine bearing, and two for elevation, arranged in aring. The two lateral horns have a horizontal bar across their mouths. Picture by kind permission of Helge Fykse. Left: The RRH acoustic locator with operators at their posts. The RRH could detect targets at distances from 5 to 12 km, depending on weather conditions, operator skill, and the size of the target formation. It gave a directional accuracy of about 2 degrees. It had a crew of three - traverse aimer on the left seat, elevation aimer on the right seat and a dial-reader/talker in the middle. The rolled-up material above the operators' heads could be unfurled to provide shelter. The curved things visible under the ring are the rear of the horns. Left: The German RRH acoustic locator again. This gives a better view of the rear of the horns, curved for compactness. Regrettably a poor quality image, but showing a completely different design with a conventional four-horn format. This remarkable picture may have been reproduced before, but I make no apology for showing it here. 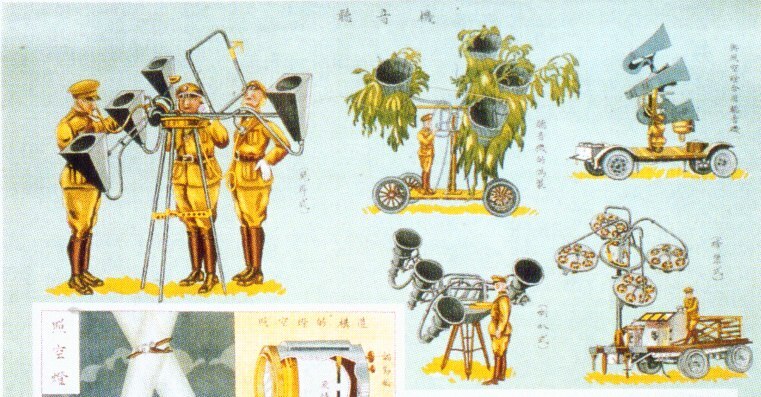 The impressive array of Japanese war-tubas belong to at least two acoustic locators mounted on 4-wheel carriages. It is a little difficult to work exactly what is connected to what, not least because the background appears to have been erased by some unsubtle retouching, but I think that the format is the same as the British model; there are two horns in a horizontal plane, and on one side of the mounting there are two more in a vertical plane. The equipment was called the 'Type 90 Large Detector'. There was a smaller version called the 'Type 90 Small Detector'. See below. To the right, one of the figures is the Japanese emperor Hirohito. 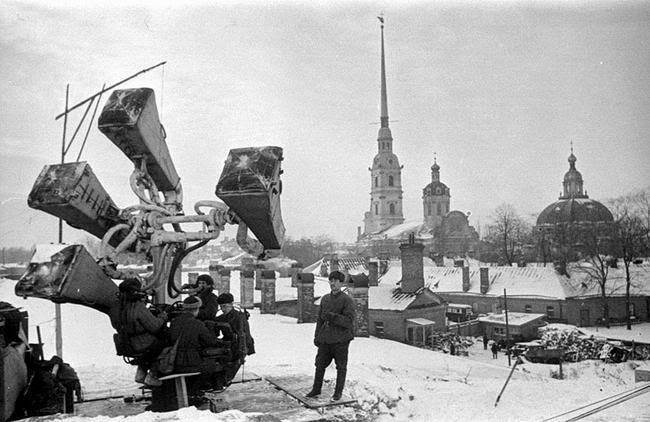 Behind him are the AA guns intended to be used in conjunction with the locators. The only Japanese gun that I have found documented as being used with a sound locator is the Type 88 dual-purpose AA/coast-defence 75mm; there is not enough visible detail to verify that these are the guns shown in the picture, but they look about the right size. This picture, of rather better quality, was clearly taken just after the one above. I am fairly sure that Hirohito is the man on the left. Note that they are describes as electric ears, which implies that valve amplification was used. 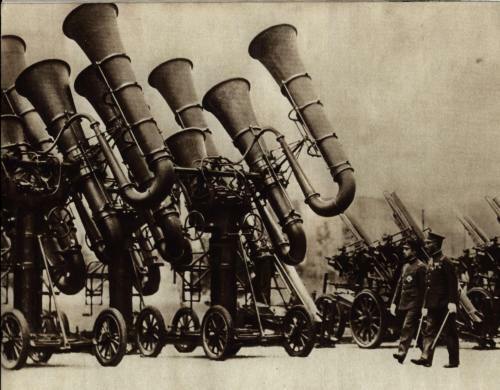 Nothing much is known about this picture of less than stunning quality, but it appears to show the same war-tubas as the picture above. Note the Japanese characters on the side of trumpets. Clearly a very similar design to that of the Japanese Type 90 Large Detector, shown above. No further info currently available. The type number for this locator is currently unknown. The building in the background is the Army War College at Fort McNair. 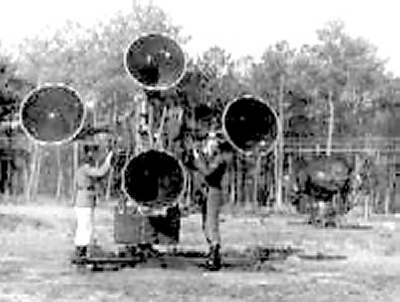 This is a T3 aircraft sound locator used by the U.S. Army Signal Corps. The horizontal pair of square horns determined the azimuth of the aircraft, and the vertical pair determined the elevation. The word "BOWEN" on the label is believed to refer to Admiral Harold Gardiner Bowen (1883-1965) who was then directing air defense research at the Naval Research Laboratory and was later involved in developing radar. "AWC" probably indicates that the photograph was taken at the US Army War College, Fort McNair. This is believed to be an official US Army Signal Corps photo. For a long time the "Sound Lag Corrector T1" was deeply mysterious and unknown to Google. Now, however you can read all about it in the Coast Artillery Field Manual 4-111, issued in 1940. The production of this comprehensive manual in 1940 seems to indicate that the USA were still putting some faith in sound location at that date. Enjoy! 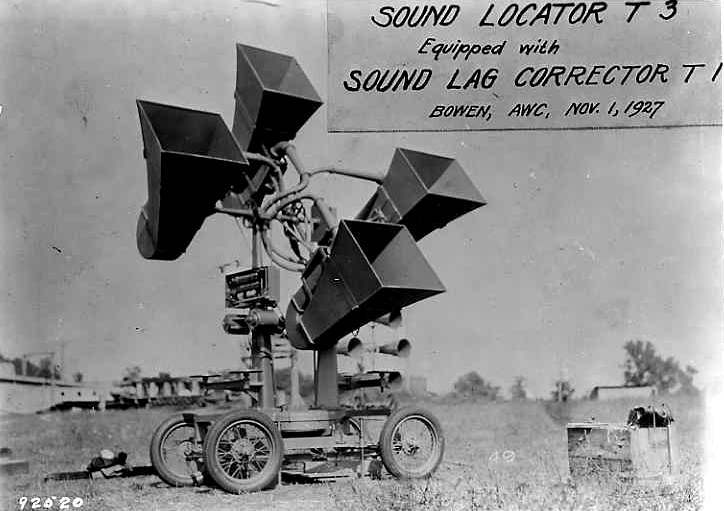 The sound lag corrector was employed because sound travels very slowly compared with speed-of-light radar pulses, so the target may have moved on significantly by the time its sound reaches the locator. Corrections were also made for wind error, and parallax caused by the locator and the spotlight it was guiding not being at the same point. There seems to be another locator with four round horns just visible at the lower right of the locator in the foreground. Note the more modern wheels than in the photo above. The M2 locator was a later development; it was in use around 1940. There are three horns and not four, the horn at top right being shared between the horizontal and vertical planes, by splitting its output tube. "The spacing of the horns varies in the different designs. Theoretically, the accuracy of the instrument increases with the length of the base line. The older models have a base line length of 112 inches. Recent exhaustive tests have shown that there is not much gained in accuracy if the length of the base line exceeds 60 inches. The new models have the shorter base line, thereby decreasing the weight and size of the instrument." "Recent extensive tests in the laboratory and in the field have indicated that horn size and horn shape have little influence on the range of the sound locator. Hence, the latest models do not have the exponential horn but a horn which has certain other characteristics." "Ambient noises are reduced greatly by the design of the latest type of sound locator. This type features sound insulating and vibration dampening materials, streamlining of the horns and supporting structure, and making the horn definitely directional within a 30� cone in the direction of the axis of the horn." The system made corrections in both altitude and azimuth. There was a three-man team; one man guided the sytem in altitude, one in azimuth, while the third man added the acoustic corrections. The corrections involved some complicated calculations, which were performed by a mechanical analogue computer, apparently housed in the small box labelled 6, though it hardly looks large enough. The basis of this computer was a ball resolver, also known as a spherical resolver. This computing device has no Wikipedia page, and I have failed to find a good link. So far as is currently known, no other country added acoustic correction to its locators. a: Reverberation of the horn structure is reduced to a minimum by constructing the horn of an impregnated cloth composition and covering all metal parts in the sound system with vibration damping material. b: Wind effect is reduced to a minimum by eliminating all sharp corners and streamlining the horn contours. c: The sound conducting tubes are insulated from the supporting structure and from the outside horn case, which reduces the transmission of noise from gears, bearings, wind, rain, hail, etc. d: The horn is of the semiexponential type, with the dimensions chosen to provide a "directional" characteristic. e: The effect of ambient noise may be reduced by proper placement of the sound locator with respect to surrounding objects. It should be positioned at a point distant from the searchlight, the searchlight power plant, highways, trees, and other objects constituting either an actual or possible noise source. In addition, it is essential that personnel operate with the absolute minimum of noise. Sound discipline must be enforced in the vicinity of the sound locator for best results." This explains why the horns on the M2 look so different from most other locators. The front is rounded off to minimise wind noise, and the rounded outer body reduces the effect of extraneous sound on the inner horn. This shows the extensive efforts made to meet the problems listed above, using latex foam and flameproof felt for vibration insulation. I'm starting wonder just why the USA put so much development effort into the M2 locator. Were they pessimistic about the possibilities of radar? This shows the considerable complexity of the M2 locator. The gearing by which the azimuth and elevation corrections were applied is at the bottom right. The horns are coloured green. 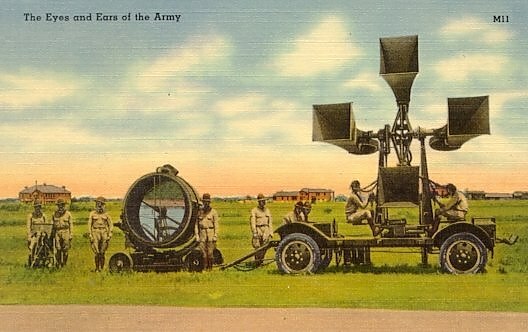 The locator and searchlight control station were connected by cables to the searchlight and a mobile electric generator. 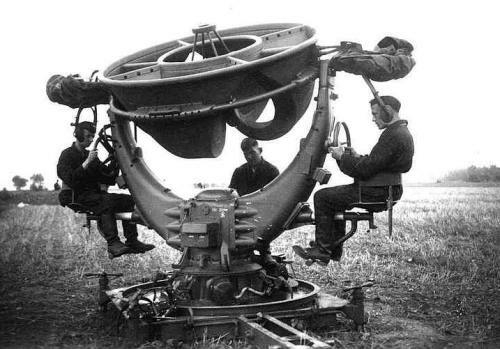 These locators continued to be deployed when radar sets were introduced, in the hope of convincing the Germans that the US searchlight battalions were still dependant on acoustic location. This photograph was dated January 1943, and was presented by the American media as being current equipment. This was probably another piece of misinformation as radar sets were already in widespread use for searchlight control at that date. 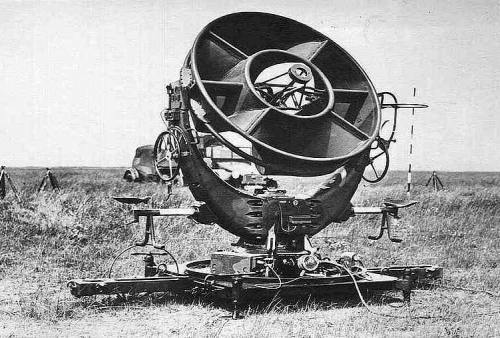 The M2 sound locator was however the standard for most searchlight units at the start of World War 2. The unit could be broken down into six components for ease of transport. It incorporated newer materials and an updated design to reduce interference from ambient sounds, whether environmental or from noise induced by its own mechanisms. The three operators stood on a platform that was acoustically decoupled from the ground and also enabled leveling of the locator. The perceived azimuth and elevation of the distant sounds were tracked by handwheels. Built-in mechanisms compensated for sound lag errors caused by the relatively slow speed of sound. 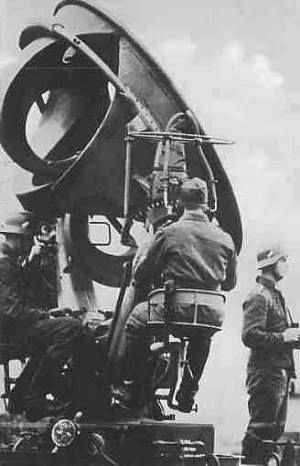 Correcting mechanisms were also provided for errors caused by wind and the placement of the locator relative to the searchlight. Note the large diameter acoustic tubes leading to the operator's headset. The cross-section of the tubing decreased exponentially from the elbow assembly at the horn to the listener's ears, with the exception of the short external sections called helmet tubes, extending from the mounting to the listener's ears. This exponential decrease formed an extension of the horn throat and intensified the sound. 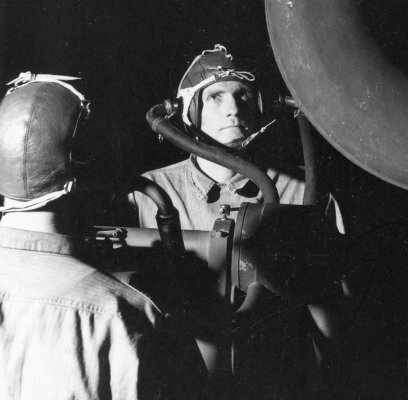 The M2 was provided with special acoustic helmets designed to exclude extraneous sounds. 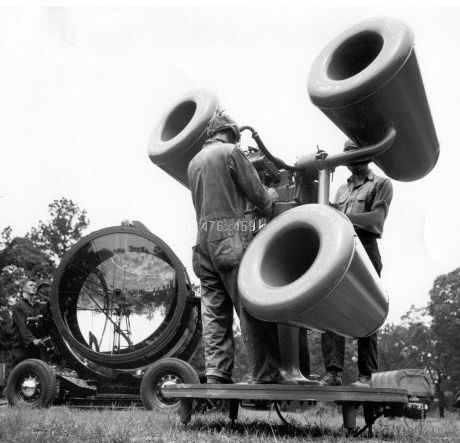 The effective range of the M2 sound locator was considered to be between 2,000 and 8,000 yards. Range was very dependent on atmospheric conditions and the skill of the operators, and could vary widely from day to day. 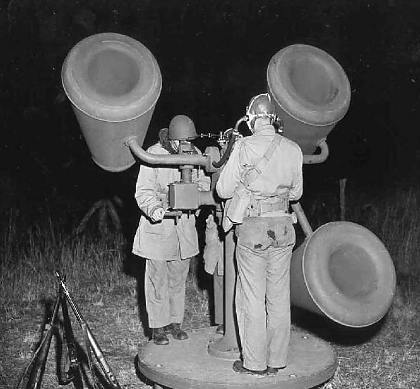 With the introduction of the SCR-268 radar for searchlight control, the M2 sound locator became obsolete and was rapidly replaced, but some searchlight organizations retained the M2 throughout the war and occasionally used them to supplement local radar. These posters were issued in the early 1930s. In 1931 Japan had seized Manchuria from the Chinese, and there were also confrontations with the Russians. It was not a peaceful area. 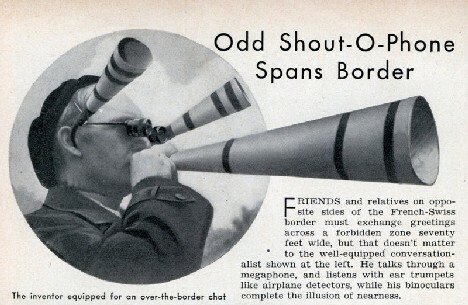 This seems to be some sort of recognition aid for foreign sound locators. 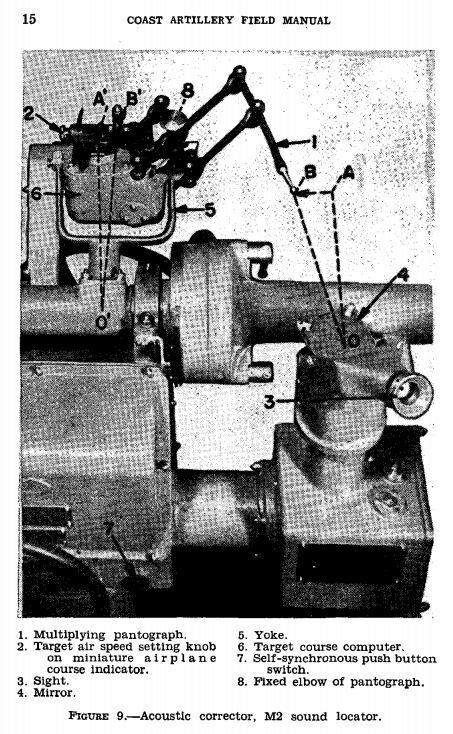 The picture on the left is of the British 4-horn locator. The picture upper middle with the luxuriant vegetation looks very like the 'sound locator of unknown origin' shown just below. Lower middle looks like the Japanese "war tuba" 4-horn locator. Upper right is the American T3 locator. Lower right is the French locator. You may be wondering why the Chinese were concerning themselves with locators whose home countries were so very far away. I strongly suspect this is due to memories of being thoroughly defeated by the Eight Nation Alliance which was formed to protect foreign nationals during the Boxer Rebellion. The Alliance consisted of Austria-Hungary, the British Empire (including Australia and India), Germany, France, Italy, Japan, Russia, and the United States. Four of these countries are represented in the poster. Left: An early four-horn system, date and nationality unknown. Unfortunately I have no information at all about this photograph. The uniform suggests the First World War to me, as the operator appears to be wearing high boots, but this is far from certain. Some years on, this device remains tantalisingly unidentified. You will note that it (or something extremely similiar) appears swathed in greenery on the Chinese poster just above. In fact, I think that the Chinese drawing was done from this photograph. The position of the operator is identical, and the carriage appears the same, even having the correct number of spokes on the wheels. This suggests that its nationality is one of the countries in the Eight Nation Alliance, and my slowly hardening suspicion is that it's an early American model. 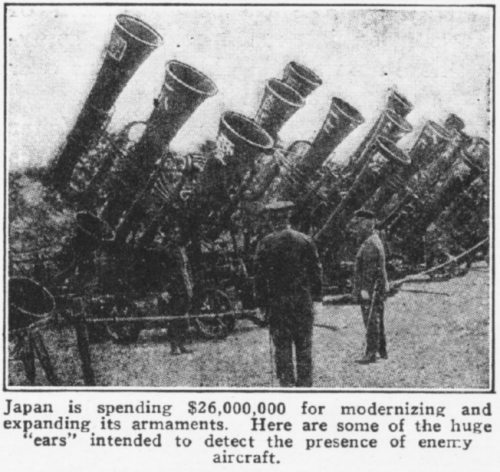 Steerable horns are inevitably limited in size, even in Japan, but a static dish can be much larger, giving more acoustic gain and the possibility of detecting aircraft at greater ranges. The first static dish was cut into a chalk cliff face between Sittingbourne and Maidstone in July 1915. Interestingly, the mirror was shaped to form part of a sphere, not part of a parabola, the latter always being used for radio aerials, searchlight reflectors, telescope mirrors etc. The part-spherical shape presumably gives better off-axis performance at the expense of on-axis precision, and it appears that all later static dishes and walls used a spherical/circular shape. 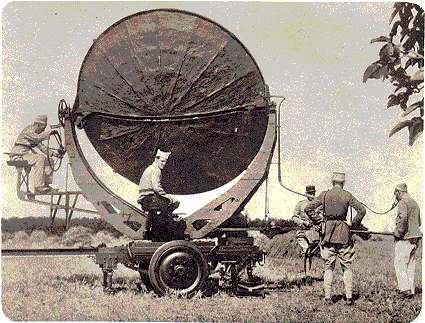 The 1915 dish had a sound collector on a rotating mount at the "focal point". Left: An acoustic locator dish in Kent, England: built 1928. This 30-foot high dish is located at Greatstone, Kent. The small concrete hut in front housed the operators. The vertical mast in the centre carried the acoustic pickup tubes. A static dish can be much larger than a fully steerable horn, giving more acoustic gain and the possibility of detecting aircraft at greater ranges. The pickup tube could be moved sideways to "steer" the direction of maximum sensitivity by a limited amount. 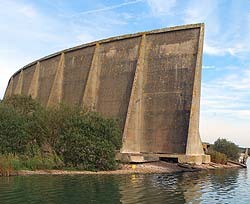 Left: An acoustic locator wall at Greatstone, Kent: built 1930. A mirror has to be much larger than the wavelength of what it is reflecting to work efficiently. This 200-foot wall was a later development designed to concentrate audio wavelengths in the 15 to 18 foot range, which were not handled effectively by 20-foot and 30-foot dishes. The wall could detect aircraft at 20 to 30 miles distance. This may not seem impressive, but in aircraft interception every second is valuable. With its later microphone installation the wall had a bearing accuracy of 1.5 degrees. By 1935 it was clear that radar was going to be a much more effective way of detecting aircraft, and all work on the sound mirrors was stopped, and the funding diverted to radar research. 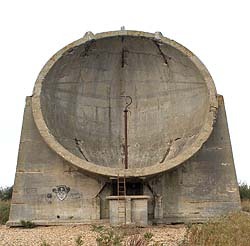 However, interest in the sound mirrors was briefly revived in 1943 when it was feared that Germany might have developed an effective method of jamming the British coastal defence radar stations. Post Office engineers made tests at the Greatstone mirror to see if the mirrors could be used after all in case of emergency. Improved electronic equipment in the detectors meant that it was now possible to detect enemy aircraft as far as 50 miles out. In the event the radar stations were never effectively jammed and the mirrors were never needed. Britain never publicly admitted it was using radar until well into the war, and instead publicity was given to acoustic location, as in the USA. It has been suggested that the Germans remained wary of the possibility of acoustic location, and this is why the engines of their heavy bombers were run unsynchronised, instead of synchronised (as was the usual practice, to reduce vibration) in the hope that this would make detection more difficult. The first Japanese attack on the fortress island of Corregidor (in the Phillipines) on 29th December 1941 was detected by American acoustic locators. There is a good bit of information on the Web about this technology, if you use the right search words. 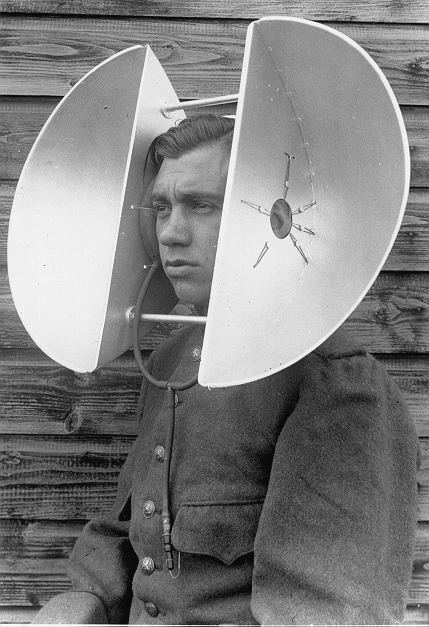 "Sound mirrors" works better than "Acoustic locators". A book about acoustic locators. Sound mirrors on the South Kent coast. How the deficiencies of acoustic location led to the birth of Radar. Some very fine pictures of German comms equipment, including rare things like the RRH and the Lichtsprechger�t 80 light-beam communicator. You will be glad to know that this page was rated "cool" by Fark.